The first new feature that we are adding in ExamDiff Pro 3.6 is an improved Directory Comparison Filters options dialog. As you can see, in addition to the Name filters option, which already exists in the current version of ExamDiff Pro, there are two new filters: a Date filter and a Size filter. The Date filter, if enabled, compares files only if their Last Modified date falls within the specified limits. The Date filter gives you three options: you can either disable the Date filter, only compare files whose date falls between two set dates, or only compare files that are not older than a certain age. The Size filter, if enabled, compares files only if their size falls between the upper and lower limits. Both the upper and lower limits may be enabled or disabled by checking or unchecking the checkbox next to them, respectively. Note that all of these filters apply only to files, not to directories, and if a file in one pane is compared, the matching file (if any) in the opposite pane will be compared as well. The major benefit of the Date filter in particular is the ability to speed up comparison by comparing only relevant files. Often you don't need to look at all files when comparing two directories, but only those modified in the last week, the last day, or the last hour. 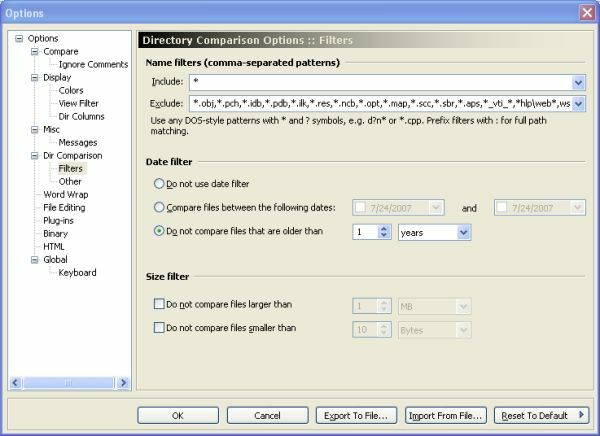 Enabling the Date filter will cut comparison speed significantly by comparing only the files that need to be compared.